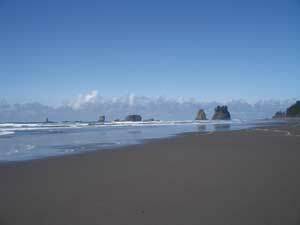 This page is a Kaleberg report on Second Beach, one of our favorite West End beaches. 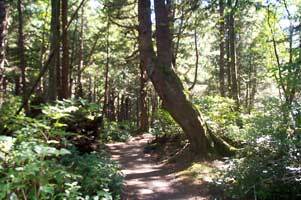 There are more Kaleberg reports on the North Olympic Peninsula. 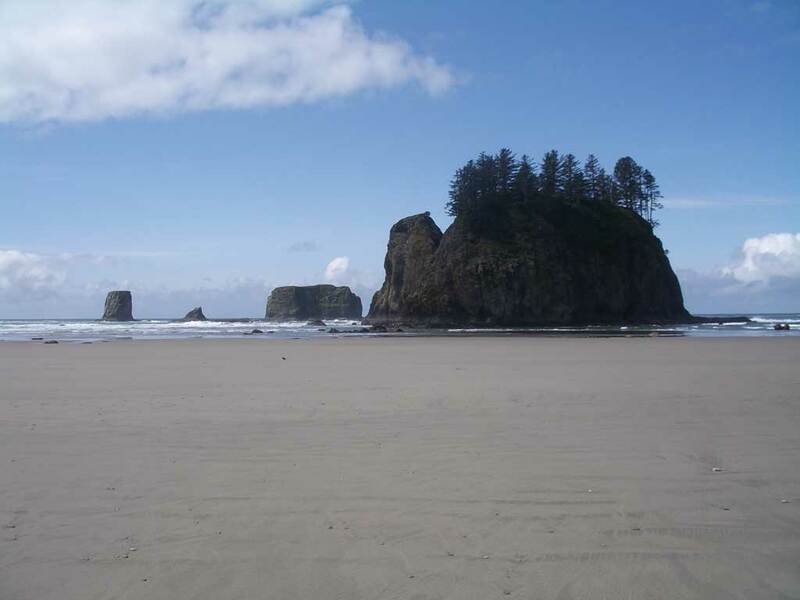 Second Beach is one of our favorite beaches on the West End. 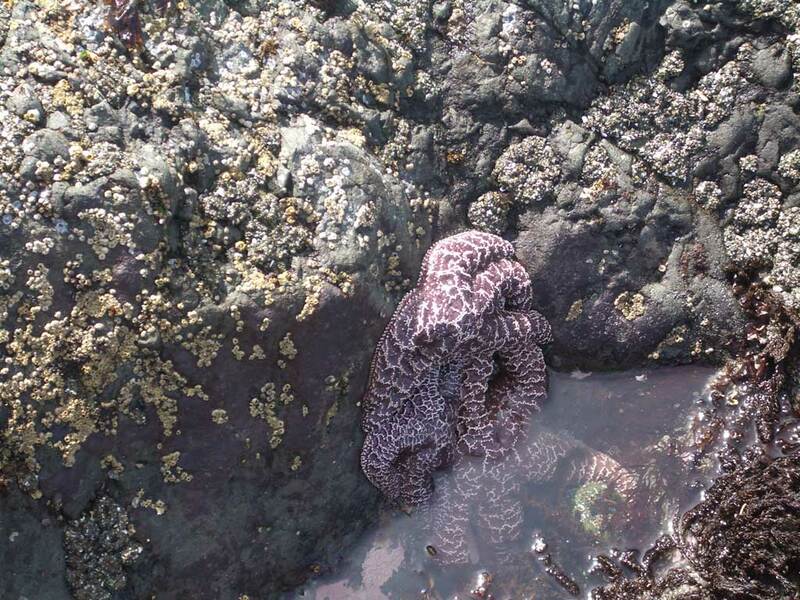 It is wild and isolated, and at low tide there are caves and tide pools to explore. 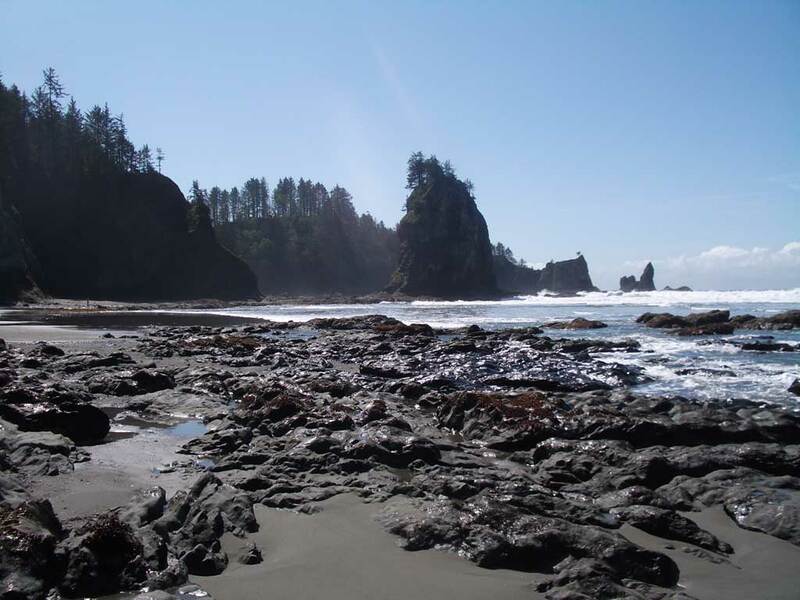 The adventure starts with a 3/4 mile hike through the forest, then there is a clamber over the mass of driftwood at high tide line, and then there is the beach, with its soft sands and seastacks and spectacular scenery. From route 101 at the Smokehouse restaurant head west on route 110. Stay on route 110 almost to the end. Third Beach is en route, but a mile or two further down, there is the parking lot for Second Beach on the left, perhaps a mile or so from the end of the road in La Push. The seastacks dominate the beach like wandering castles drifting across the mystic sea. There they are, rocky towers and miniature forests standing out above the sandy flats and wild ocean water. The seastacks are continental drift writ small. Some of them can even be explored by the hardy, and we have heard travelers' tales of wild strawberries ripe in the summer. 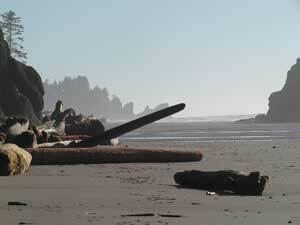 Second Beach was closed for nearly two years in a dispute between the local Quillayute tribe and the federal government. 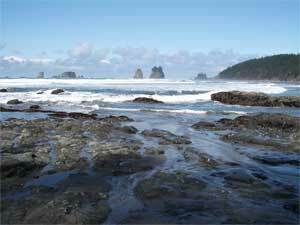 The tribe is centered at La Push, just down the road from Second Beach, and it has long been seeking high ground in the event of a tsunami. 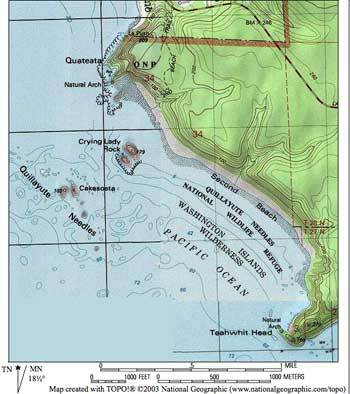 Various land swaps had been proposed, but since the lands were variously national park land or tribal, congressional action was necessary. 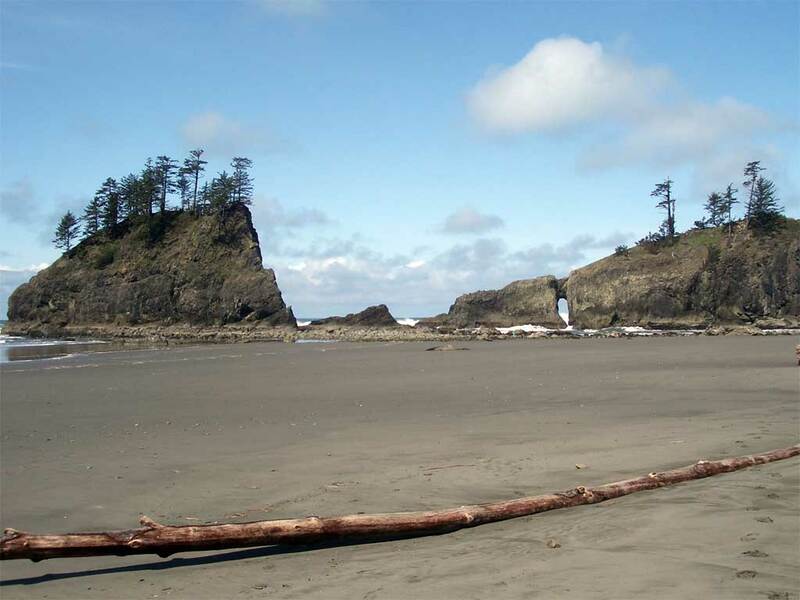 While, as of April 2007, no agreement has been signed, some agreement has been made to the tribe's satisfaction, and Second Beach has been reopened to the public. 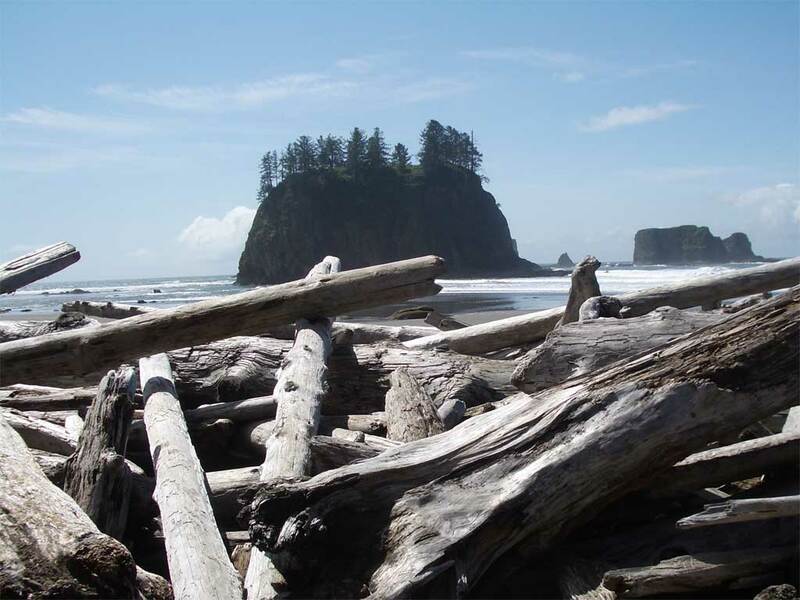 However you explore Second Beach, there will be driftwood and the green forest to the east and the wild Pacific Ocean to the west. The rocky shallows protect the land from the full force of the sea, and the seastacks stand as sentinels. The is only a short walk north from the forest trail, but the walk south takes quite a while, especially if you stop to explore. There is a wonderful sea cave near the south end of the beach. 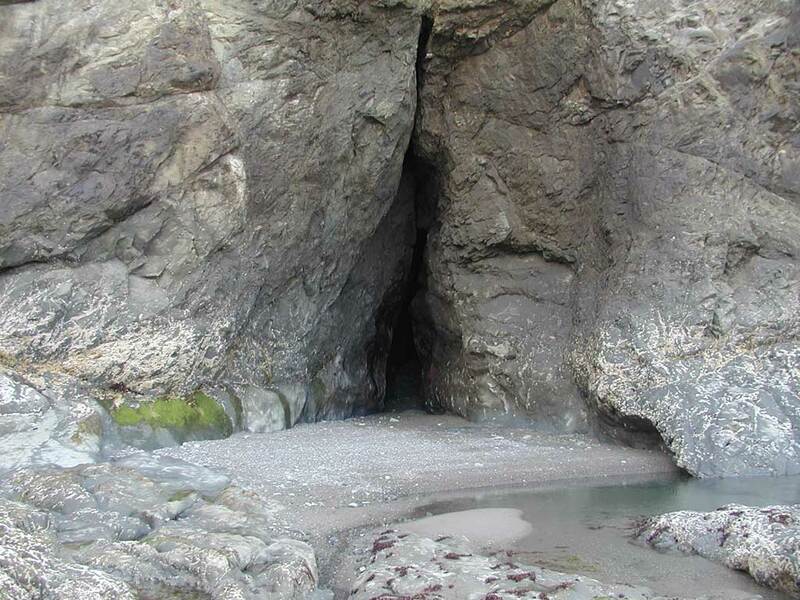 It's the perfect place to stash your pirate treasure, at least until the tide comes in. 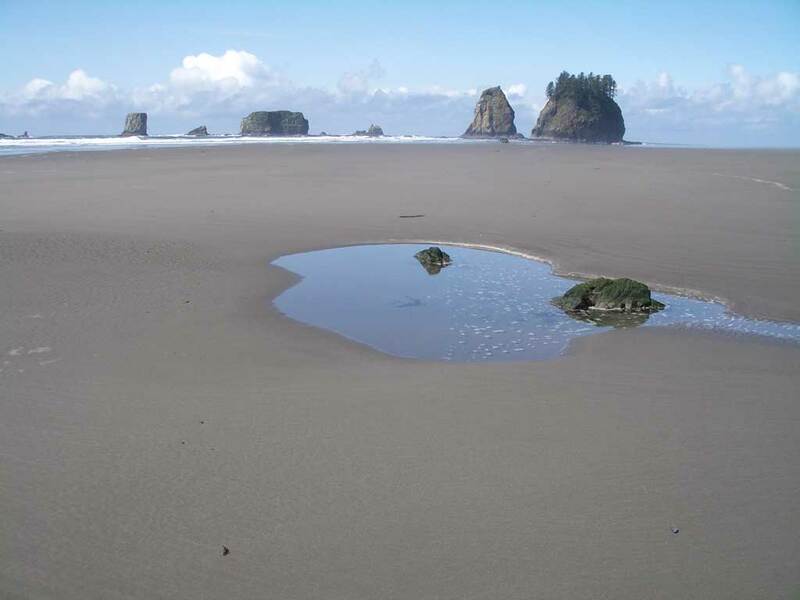 For this alone, it is worth checking the La Push tide tables and aiming for a proper low tide. Try to get to the trailhead about an hour before the minimum and a whole world will be revealed at the southern end of the beach with caves, cliffs and tidepools. 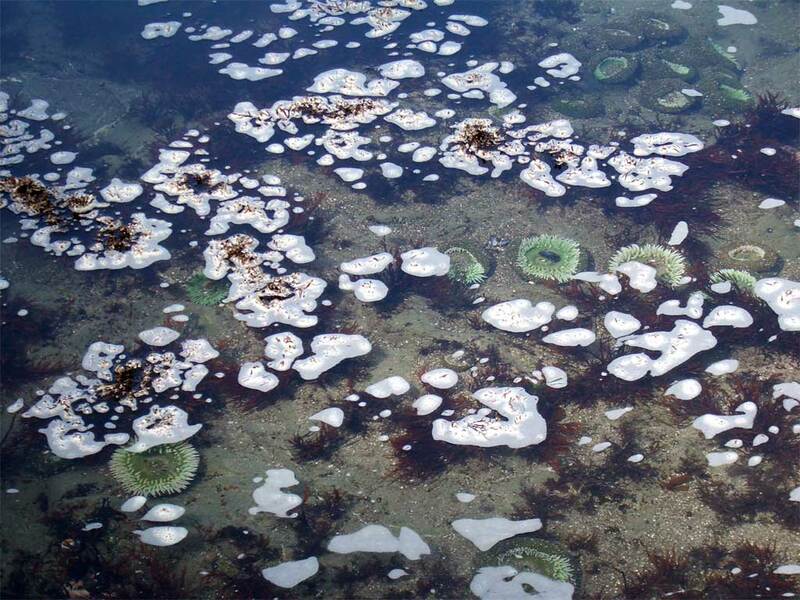 All of this will be underwater or unreachable at high tide, though the beach has its rewards then as well. 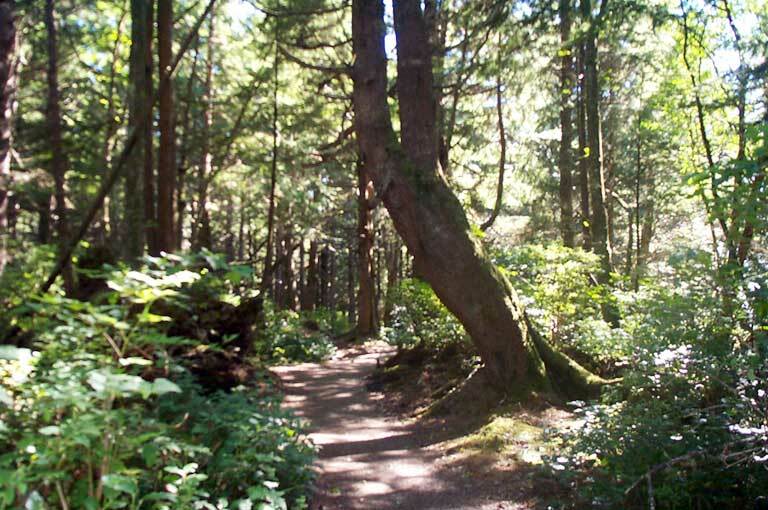 The walk from the parking lot to the beach passes through a classic northwestern forest with ferns and salal and some great old trees. 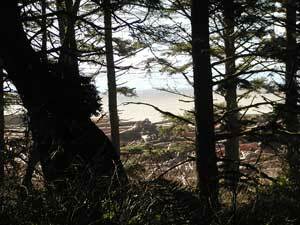 The forest scent is soon tinted with salt air, and the descent to the beach is dramatic from behind the forest wall. 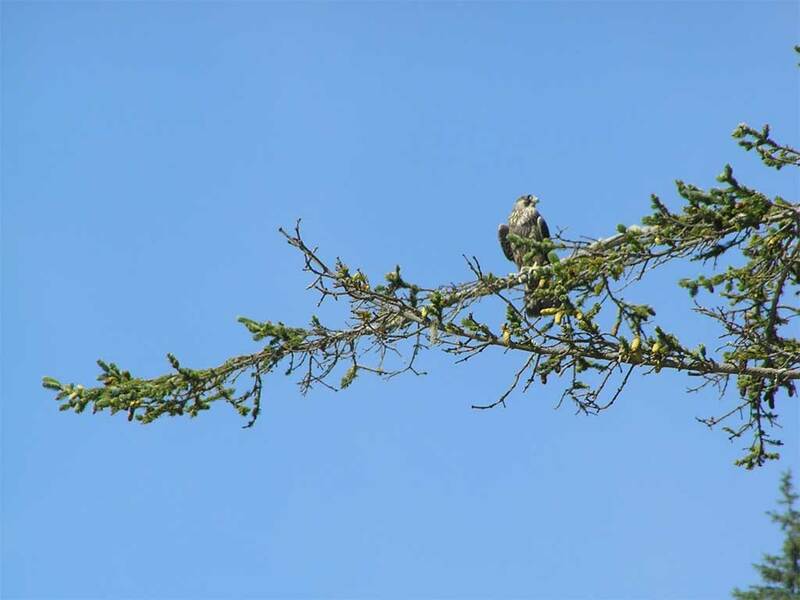 On the beach, watch for birds. There are gulls, hawks, eagles, and sea ducks. Sometimes, migrating whales are visible in the deep water. 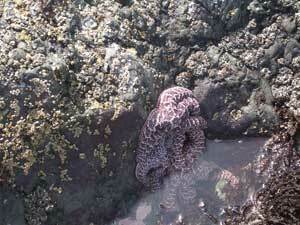 At low tide, the sea draws back, and the anemones and star fish can be found in their tidepools. 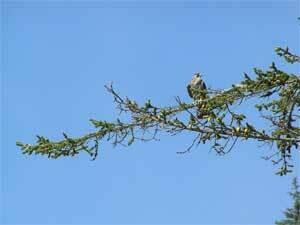 Watch the tree line for bald eagles and hawks, like this one. Tide Tables - Second Beach is the next beach up from La Push, so we use the La Push tide tables. Here is the Kaleberg version produced by the Flaterco XTide program, and a link to the iCal calendar showing good hiking tides. 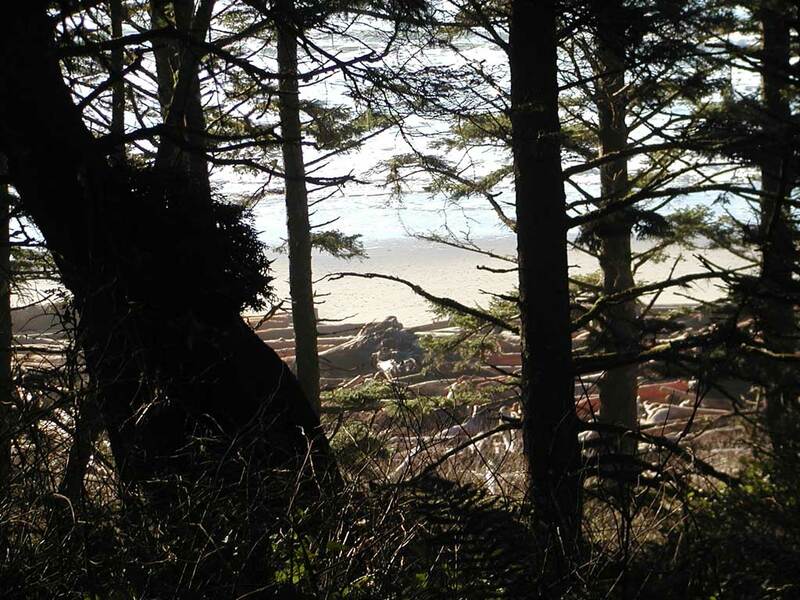 Here is the Kaleberg page describing the Second Beach hike, as we first perceived it. Since then, we've headed farther north. 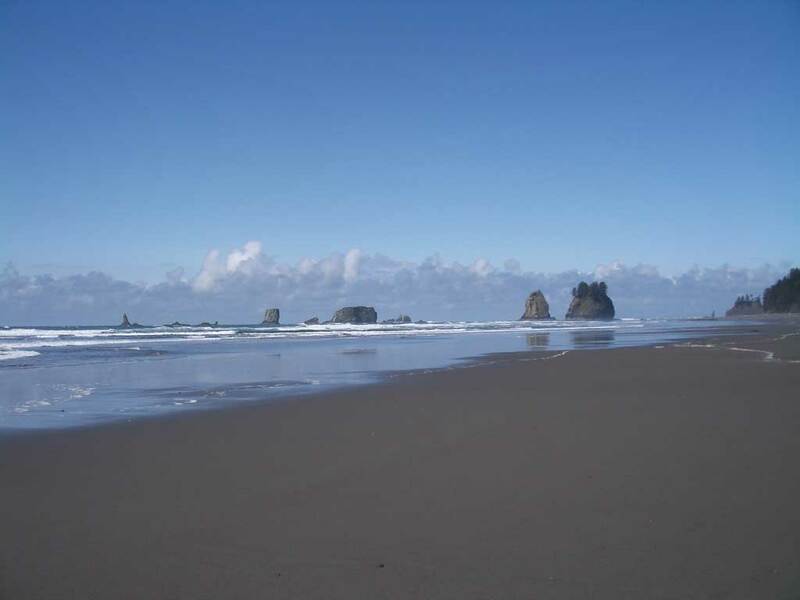 This panorama shows Second Beach and covers several miles of coastline. 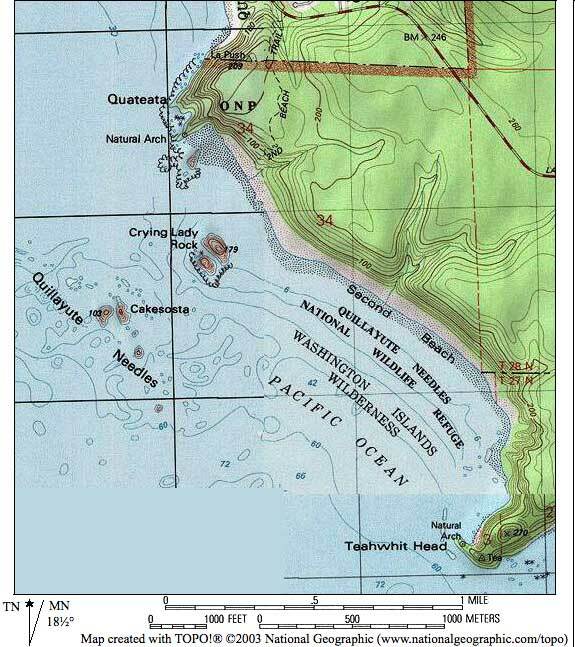 You can see a number of the seastacks and headlands. Click on the image for a much larger view. 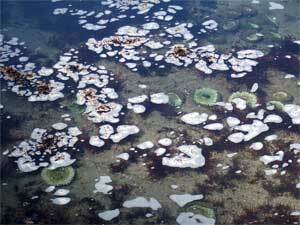 The images used were taken for the Washington State Department of Ecology in 1994 and are available online.